Midway was found as a stray in a business park and trapped by NMHRS. She is a little shy but very sweet. When it is breakfast and dinner time she gets very excited. 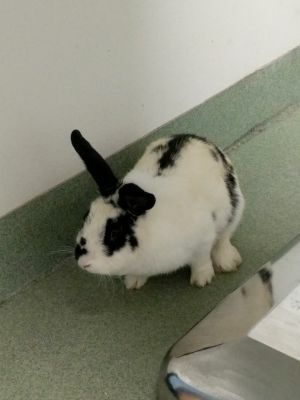 Midway is a quiet, calm bunny who is well-behaved. At about 7 pounds she's a little bit larger than the average bunny. Buttercup (f) and Wesley (m) are a lovable pair that enjoys lots of snuggling and grooming together. Buttercup is a natural explorer and Wesley is more of an observer. When they are comfortable in your home, get ready for some epic binkies - these two do not disappoint. 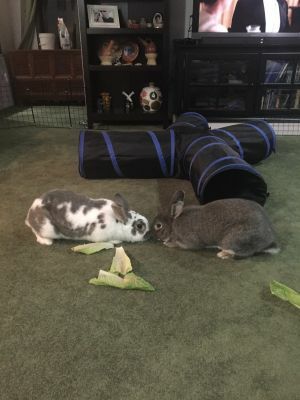 They would be best in a house with no other rabbits, as they enjoy being the king and queen of their castle, and need experienced rabbit owners. Buttercup is white with gray markings, while Wesley is mostly gray. These two must be adopted together and never separated. 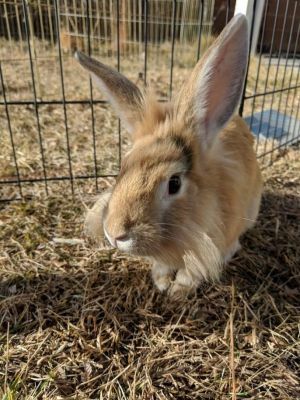 *This is a courtesy listing for a third party needing to rehome their rabbits. Do you love fuzzy cheeks? Then Tate is the bun for you! Tate was found as a stray when he was about 3 months old at the end of October. He is a friendly energetic bunny who will climb all over you if you sit on the floor with him. Since he is young he still has a lot of energy and would love to show off his binkies for you. He looks forward to his supervised outdoor time so that he can romp, dig, and nibble on fresh grass. Tate is an absolute joy and is guaranteed to make you smile. To find out more, please call 505-435-9916 or email Kirstin@newmexicohrs.org.